Heat griddle to about 350 degrees. Sprinkle peeled, cleaned and deveined shrimp with salt to taste. Oil griddle with soybean oil. Place shrimp on griddle and saute about 3 minutes on each side. Mix melted butter with heavy cream. Cut shrimp into bite sized pieces and dot with mixture made from butter and heavy cream. Sprinkle with parsley and return to griddle. Cook 1 to 2 minutes longer. 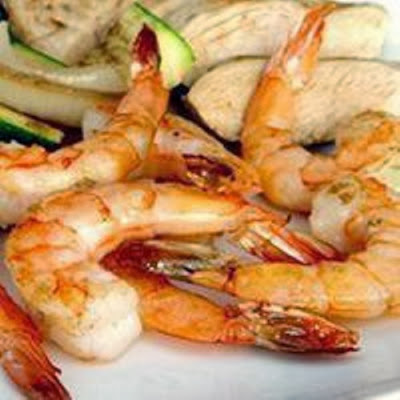 Squeeze juice from half a lemon over the shrimp.